Dupin needs your help solving the mystery of the gold bug. 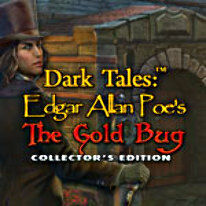 Edgar Allan Poe’s classic tale gets a reboot in this fourth game in the well-loved Dark Tales series. You and your detective companion Dupin have been summoned to the seashore to help William LeGrand discover the exact location of a treasure lost hundreds of years ago. But LeGrand isn’t the only one with designs on the pirate booty…A masked villain tries to make off with the code, and a mysterious woman in a veil seems to be connected. Follow the clues – with the help of the superior sniffing abilities of your Newfoundland sidekick – to track down the treasure and foil the criminal’s plans.